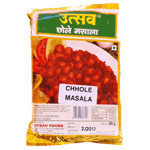 Chana masala also known as chole masala or channay (plural) is a popular Punjabi dish in Pakistani and Indian cuisine. The main ingredient is chickpeas (called "chana" in Hindustani). It is fairly dry and spicy with a sour citrus note. Product of India.